This Website gives our residents and visitors easy access to Alabama's coastal conditions, health and environmental data, to enhance your coastal stay. Advisories provide current information to ensure a safe visit to Alabama's coast. 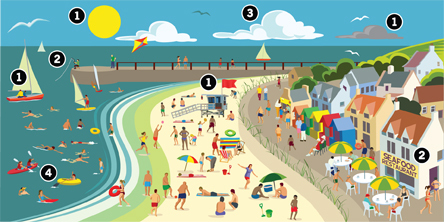 From weather to beach to boating, you'll be informed of conditions as you plan your stay. Select the topic below to get information about current advisories. Dining on seafood is a an essential experience while visiting our coast, whether catching and cooking it yourself or being served in a restaurant. To discover the benefits of eating seafood, as well health and environmental considerations, select the topic below. Air quality can affect your coastal activities, especially if you have allergies or general pulmonary issues. Select the topic below to learn more. Without clean water, coastal activities may cause health issues. To learn more select topic below. Email Bureau of Communicable Diseases if you have suggestions, comments or questions about this Web page.